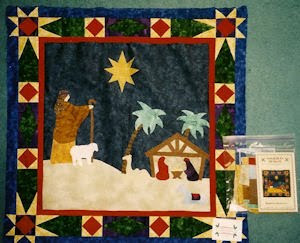 This one was hand-quilted using pearl cotton, I think, in appropriate colors. It was referred to as "quick stitch" or "big stitch" at the time--I can't remember which. This was a small wall banner--maybe 6 inches across and 16 inches long. This was a Christmas panel we had in the store and coordinating fabrics. 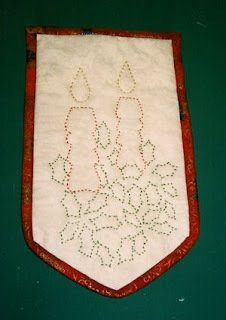 The bottom is a pocket for Christmas cards, stiffened with interfacing to keep it hanging upright. 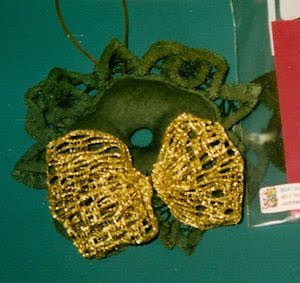 For this little green wreath, we ordered green doilies, sewed them together around the center hole by machine, then turned it right side out, sewed along the edge of the lace, leaving an opening, stuffed it, hand-sewed the opening closed, and added a metallic bow and hanger. Another pattern pack packaged with batiks and marbles. I loved this pattern. I wish I could remember who created the pattern, but I can't read that little type. It was a good-sized wall-hanging and all the pieces were fused in place. 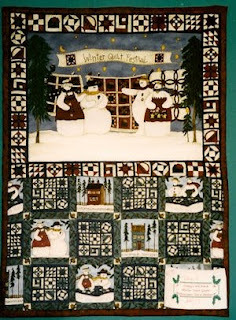 This was one of the favorites -- we were the Beaches Quilt Shop, after all. 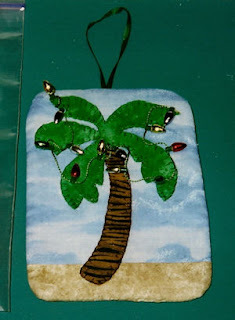 We drew a palm tree, used a zebra stripe for the trunk, and hand-sewed little faux lights on the trees. Having been there for a Christmas, I saw first hand that the residents of the Beaches actually did decorate the palm trees in their front yards, and I thought it was the coolest thing! So this was a must-have. Coming soon, the other days. So far, I've only found 11 of the 12 projects, so we might have to pretend. The 12th will turn up sooner or later, I'm sure. Very cool palm tree! I like how the zebra print works as texture for the tree trunk. Thanks for leaving your blog site for us to read, it's a great blog. Check our facebook page on Friday to find out the winner of the Blog-of-the-Week! Everything is so cute, keep up the good work!